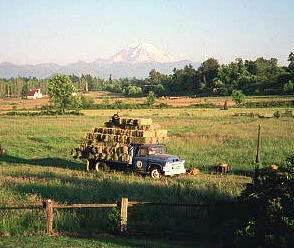 Each year, Murray LLC harvests field hay for use in raising their Polled Hereford beef, and for sale to consumers. 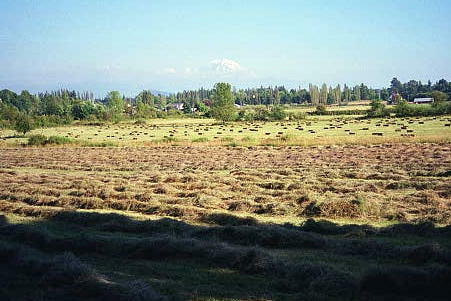 The hay is suitable for both cattle and horses. Every summer we make 1st and and 2nd cutting grass hay to sell to support our farm. We also have large round bales - both "dry rounds" and "haylage" (wrapped in plasic) for $50 each, either kind. Dry rounds are suitable for horses, haylage is not. Contact us if you need further details. Limited quantities of premium hay such as Timothy or Horse Hay, may also be available, depending on the year. Contact Murray LLC for details.